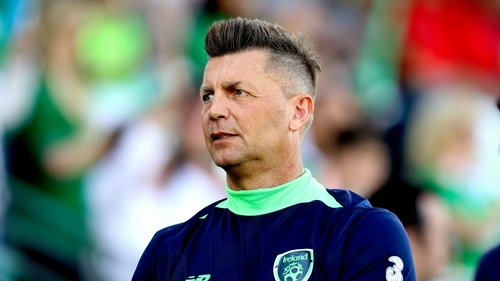 Republic of Ireland Women’s head coach Colin Bell says his team are capable of causing a team of Italy's calibre serious problems when they meet in this evening in a friendly encounter. Bell has a clean bill of healthy to report for the game at the Mapei Stadium (kick-off 5.30pm Irish time), with the squad coming together on Monday. Bell says his squad is looking good and are all very much looking forward to the fixture. "We’ve had a very good camp with some good quality training; the players are looking individually very good and tactically strong" he said. "These are the tests that we need, we need to be competing against top nations to see how far we’ve come and how far we have to go." Bell said: "Personally, I’ve always been a big fan of Italian football and Italian coaches, so it’s going to be very exciting to play the game here. The girls have worked really well and now it’s just a case of putting what we’ve done in training into practice in the game and reacting to every situation as well as we can. "I think they’ll start very aggressively and with a high tempo. They are preparing for the World Cup so they will obviously want to push themselves, it’s a home crowd, all these things will play a role. "We’ll have to weather that storm to start off with and make sure that we stay organised and take that pressure. But that’s what we expect when we play in the European qualifiers against Germany and the Ukraine, so we must learn to deal with those kind of situations." "This game is about seeing how far away we are from being able to beat a number one seed"
"We also have enough ability to try and do damage when we have the ball and when we go forward and that’s what we have to try and exploit. Their players will be battling for places, to make that final cut to go to France. "That’s why we picked this game. This game is about seeing how far away we are from being able to beat a number one seed. That’s the barrier we have to get over." Captain Katie McCabe says the players are in good spirits ahead of the tie and will be looking to make their mark on the game. "It’s nice to get back into camp, it was obviously a quick turnaround from Marbella but it good to get focused and get in the game mode again," she said. "This is their last game before their send-off for the World Cup, so no doubt they’ll be looking for a win but we’re certainly not going to roll-over and give it to them, we’re going to prepare the way we will be preparing in the qualifying campaign. So, it’s a big challenge as we both will very much want the win." The 23-year-old Arsenal midfielder feels that the squad are getting better and better every time they are together. She said: "We’ve come a long way, especially in the last two years with how we’ve tried to play and our approach. It shows how far we’ve come as a nation to be getting big games like this against big teams. "We learned a lot of lessons from our last qualifying campaign. You always should be learning, even when you’re winning games there is something to learn, and obviously if you lose, there are things you need to put right." 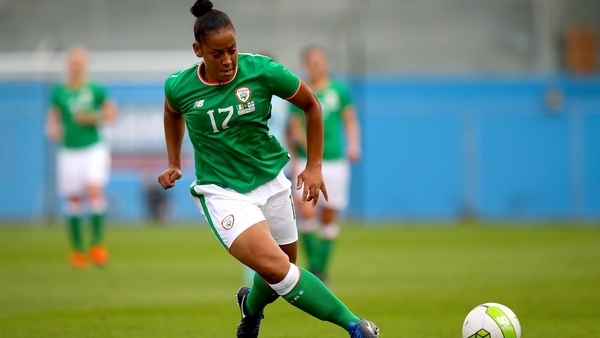 The Tallaght woman is also progressing with pace in her club career and was nominated for Player of the Month in the FA Women’s Super League. She is hoping for a successful finish to the season. "I was feeling confident coming into to camp off the Birmingham game, getting the goal was great, to send Arsenal back into the Champions League where we haven’t been in five years and that’s where a club like Arsenal should be," she said. "And we’ve a big run-in now, with three games left to try and claim the league title. I’m very happy there, things are going great and it’s always going to be good to be involved in a title race." Watch Italy v Ireland live on the RTÉ Player (kick-off 5.30pm).